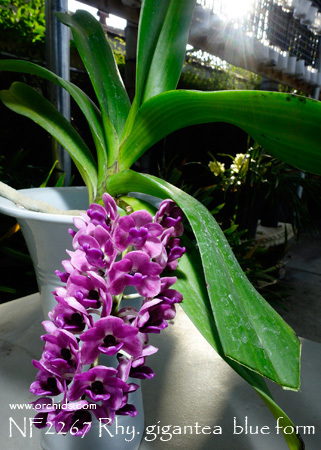 We are pleased to be the first to introduce to America this unusual color strain of Rhychostylis gigantea ! 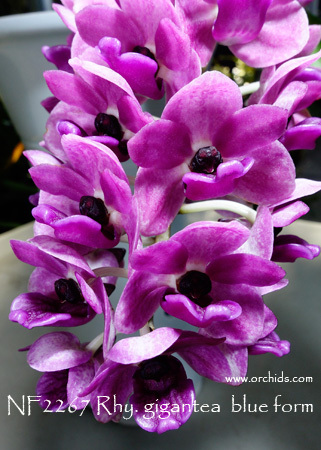 A breeder in Thailand has achieved this stunning color strain by crossing Rhy. gigantea ‘Orange’, a peach color form, with a red color form. The result has been exciting, giving us deliciously fragrant grape to blue flowers, all accented with a very dark, almost black, anther cap for the ultimate in dramatic contrast. A more compact grower, this strain has also given us great flower form for the species. For cutting edge color from this species, these are Very Highly Recommended !